Death of Monopoly: Spielbox in English! Great news for games addicts (at least I think so). The great German games magazine Spielbox is now going to be printed and shipped in English. 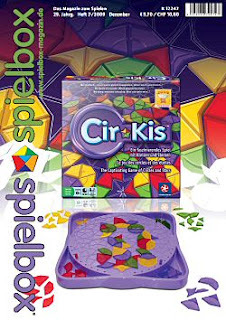 Spielbox is well-known for often including expansions for popular games in its pages. I had to order one from overseas to get the Stone Age expansion (game still sucked...) You can order your subscription here although it's not too cheap. And although Games Magazine holds a dear place in my heart (mostly due to my teenage years devouring the December Top 100 issues), as far as board games go, it doesn't hold a candle to the articles in Spielbox. But I treasure my Games Magazine subscription, Laura, I really do! LOL... I was just going to ask if you'd started receiving it yet?